Are you ready to upgrade to durable yet elegant granite counter tops? Let Stonecrafters near Barrington show you a more natural and beautiful way to enhance the look of your home. While granite kitchen countertops may be more expensive than other materials, the benefits over laminate far exceed the cost factor. At Stonecrafters we treat our customer’s right! Service that is based on values of quality, service, and integrity makes us the number one choice in granite countertops. One-of-a-kind granite countertops with excellent customer service are what you will get from Stonecrafters! Stonecrafters wants the residents of Barrington to know that we are confident they will receive the best granite kitchen countertops backed by over 20 years of experience in the Chicago area. We guarantee it! Located in Cook County and Lake County, Illinois approximately 32 miles northwest of Chicago is the affluent suburban village of Barrington with just more than 10,000 residents. 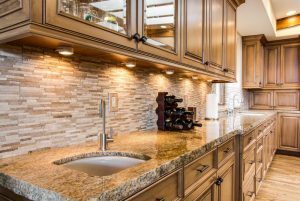 When residents of Barrington are looking for long-lasting and affordable granite counter tops to match or enhance their beautiful home, they call Stonecrafters! Many people choose granite kitchen countertops for the elegant look it creates in any home. The natural stone ensures that your granite countertops will be uniquely yours, never duplicated or mass produced. Granite countertops are durable and will last a lifetime without losing their pristine look. Another advantage over laminate, or even tile, is that granite kitchen countertops are heat and scratch resistant, chemical resistant and can’t be dented. For more information or to schedule a new granite countertops fitting, call Stonecrafters at (815) 363-8730 today!